Notable prints and patterns for the men's volleyball team. Two Olympic gold medal winners wearing their Loudmouth pants. The 2012 Summer Olympic Games will feature several Bay Area athletes and at least one Bay Area company. You might remember one of the big stories of the 2010 Winter Games involved a Norwegian curling team and their wild pants. They were the media darlings for a while with their red, white and blue checkered pants -- pants manufactured by Bay Area-based Loudmouth. Loudmouth has announced it will make more red, white and blue apparel, but this time it will be for the real red, white and blue American team. Loudmouth is the official apparel sponsor of U.S. Men's Beach Volleyball team. "As a big sports fan, and a proud American, designing apparel for a U.S. Olympic team is a career highlight for me,” Loudmouth Founder and Designer "Woody" said. 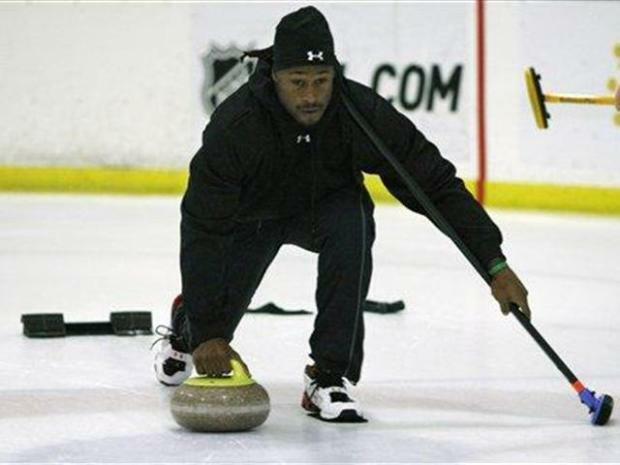 Join 49ers Pro Bowl tight end Vernon Davis on the ice as he takes on a new pursuit... the Olympic sport of curling. Loudmouth said it has designed a loud lineup of board shorts for the team. Olympic Gold Medalists Todd Rogers and Phil Dalhausser will also wear Loudmouth's pants, shirts, shorts and accessories whereever they go in London this summer. "We’re stoked to wear Loudmouth leading up to and during the 2012 Summer Olympic Games,” said Rogers. The company was founded in Sonoma. It's warehouse is in Union City. Anybody can buy the product. Among the list of celebs found wearing Loudmouth are John Daly, Penny Marshall, Dennis Rodman, Alice Cooper and Weird Al Yankovic. Below is Loudmouth founder Woody and CEO Larry Jackson talking about their company and their contract with the gold medal winners.